Remember Tom Izzo, and his courting with the Cleveland Cavaliers? Dan Gilbert's devotion to Michigan State, alma mater, is unquestioned, but what didn't he do to try to get Izzo to coach his NBA team? So why would anybody think it will be any different when it comes to Stephen Ross, as prominent a Michigan alum as there is, and the owner of the Miami Dolphins. The Dolphins are a disappointing 7-7, just the 11th seed in the AFC and very unlikely to make the playoffs. In three years, Joe Philbin, Miami's head coach, is 22-24. It's unlikely he will be back next season. - The Dolphins possess one of the best young quarterbacks in the NFL in Ryan Tannehill, and a solid defense. It is not a major rebuilding job like at Michigan. The Dolphins are capable of winning now. - The NFL pays more. Harbaugh would likely make more than $8 million per year as the Dolphins' coach. Only Alabama's Nick Saban at $7.1 million makes more than $5.6 million among current college coaches. 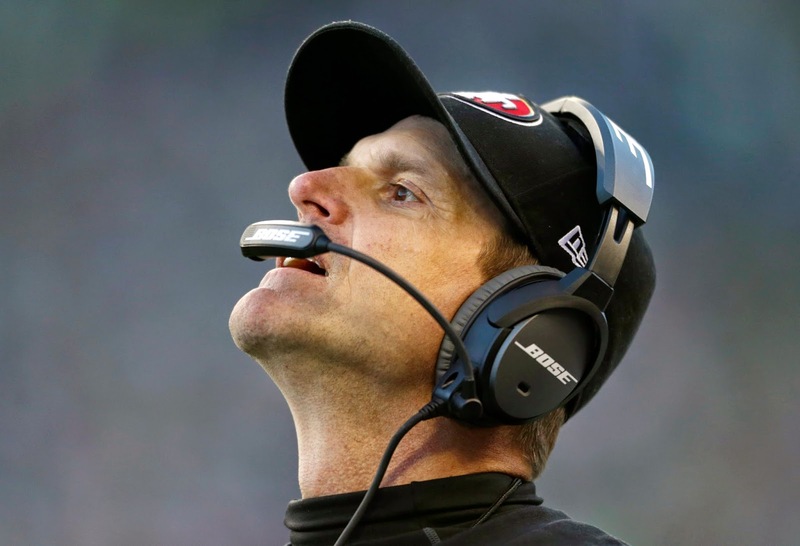 - For all the waxing poetic about how Harbaugh is a "Michigan man," he is also an NFL man. He's played or coached in the NFL two decades. It's clearly his comfort zone. - The NFL is all about coaching. The recruiting game is out of equation. It's an interesting situation with Ross. Nobody has ever donated more money to Michigan. The business school is named after him. But it would be naïve to believe he wouldn't take Harbaugh as the head coach of the Dolphins because of his alma mater. Interesting, but you overlooked something. As long as a guy named Brady is playing in New England, conceivably another 3-4 years, the Dolphins have little chance to even win their own division. And Buffalo's coming on as well. Even Ross would likely only give him a 3-4 window to show him the promised land before giving him the boot, and he'd go in competing against a stacked deck. True, Michigan would be a total rebuild job, but there's nowhere to go but up, and Harbaugh has proven he can quickly resurrect a college program. Besides, it's his alma mater, and consider what sort of "conquering hero" he would be "hailed" as if he turned the Wolverines around like he did Stanford. The money? Does it really matter whether it's 6 or 8 million? To boot, it's in the Harbaugh family DNA to be ultra-competitive about everything. The thought here is JH would rather be out hitting the college recruiting trail in the off season rather than sitting around wondering what moves his GM at Miami will make next. He likely can't win big at either place in the next few years, but he could become an icon at one place. And it's not Miami. Pat, Tigers do have three strikes against but they did improve their D with Jose and Gose. They improve team speed with Gose. Their starting should be almost as good as last year. I consider Cespedes a better player than Hunter now. This should all help. The Wilson will be your 7/8 inning guy due lack of competition. The three strikes they have is no bullpen, teams are going to try get the pitch count up on the starters and other teams in the AL have improved. The White Soxes, Jays, Mariners and Red Soxes have improved. These teams are one or two players away. The Indians staff does have potential and Royals make to the WS. I am still in state of shock over Soria option was pick up. The reason is the 7M could have been use on a better pitcher coming out of the pen. They should on in on A Miller, he only got 9M and for only 4 years. There is no closers available in the 2016 free agency. So they have to do another trade next year but with what. Current offer from Michgan is $49M over 6yrs. That's $8+ Million per year...I thought "the NFL pays more"?? 8 million/6 year would make Jim the highest paid coach in College or the NFL. Only Sean Peyton makes 8 million on a 5 year deal.